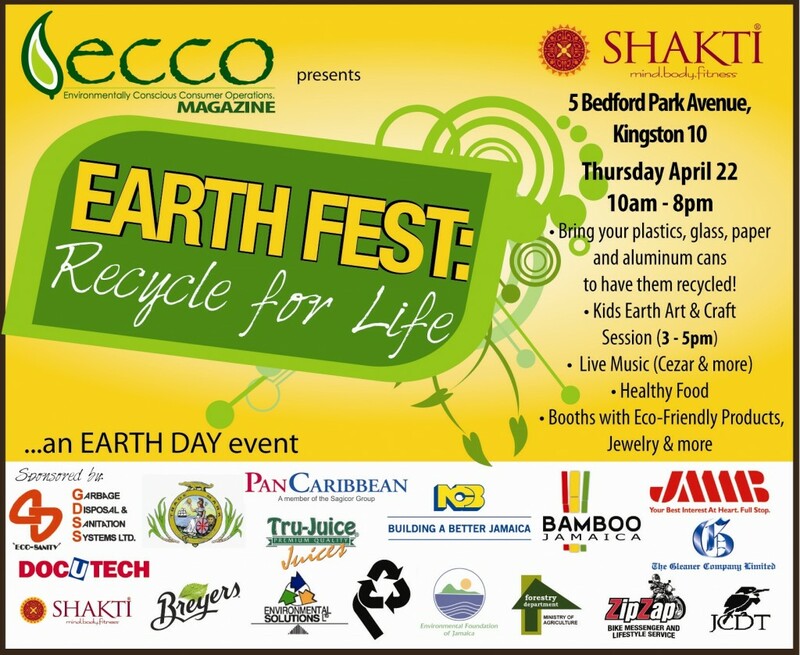 On Thursday, April 22nd, Shakti Mind Body Fitness and ECCO Magazine will be hosting an all-day Earth Day event entitled ‘Earth Fest: Recycle for Life’. The event will be held at the gardens of Shakti and will include live music from Cezar, some of Kingston’s finest drummers and Voices for Climate Change – a musical group comprised of heavyweights like Queen Ifrica and other musicians who donate their time for the positive cause of spreading the word about caring for our planet. Two hours, from 3-5pm, will be dedicated to kids, where they will be guided in making Earth-friendly art and craft. The entire grounds will be decorated by Bamboo Jamaica, and many environmentally-friendly booths will be displaying art, jewelry, home accessories, healthy food, organic produce and much more. Shakti also has incredible activities in place for the week leading up to the event, including the giveaway of hundreds of trees for planting and earth-loving themed yoga, spinning, weight and fitness classes. The Shakti/ECCO duo are inviting the public to come to this free, fun-filled and positive celebration of our Earth! Patrons are encouraged to bring plastic, glass, paper and aluminum cans to be recycled. Many environmentally-conscious companies and organisations have partnered with Shakti & ECCO for this exciting, first of its kind event. Sponsors and partners include: NCB, Bamboo Jamaica, Garbage Disposal & Sanitation Systems Ltd., J. Wray & Nephew, Environmental Foundation of Jamaica, Forestry Department, Environmental Solutions Ltd., Tru Juice, Breyers, JCDT and ZipZap Bike Messenger Service. on a regular basis, if so afterward you will absolutely obtain fastidious know-how.